Phillips Exeter Academy Library is a library that serves Phillips Exeter Academy, an independent boarding school located in Exeter, New Hampshire. It is the largest secondary school library in the world, containing 160,000 volumes over nine levels with a shelf capacity of 250,000 volumes. When it became clear in the 1950s that the library had outgrown its existing building, the school initially hired an architect who proposed a traditional design for the new building. Deciding instead to construct a library with a contemporary design, the school gave the commission to Louis Kahn in 1965. The library opened in 1971. In 1997 the library received the Twenty-five Year Award from the American Institute of Architects, an award that recognizes architecture of enduring significance that is given to no more than one building per year. Kahn structured the library in three concentric square rings. The outer ring, which is built of load-bearing brick, includes all four exterior walls and the library carrel desks immediately inside them. The middle ring, which is built of reinforced concrete, holds the heavy book stacks. The inner ring is a dramatic atrium with enormous circular openings in its walls that reveal several floors of book stacks. The first library at Phillips Exeter Academy was a single small room. A member of the class of 1833 remembered it as containing "old sermons and some history, scarcely ever read". Even as late as 1905 the library had only two rooms and 2,000 volumes. In 1912 the Davis Library was added to the campus with space for 5,000 volumes. Although a major improvement, its atmosphere was inhospitable by the standards of later generations. Stacks were locked to students, for example, and the librarian's office was located at the entrance to the stacks to maximize control over entry. Decisions about book selections and the library's program were in the hands of an all-male faculty committee instead of the female librarian. In 1950 Rodney Armstrong became librarian, the first with a graduate degree in library science. One of his first moves was to open the stacks to students. That solved one problem, but the real difficulty was the lack of space. The library contained 35,000 volumes at that point, many of them stored in cardboard boxes for lack of shelf room. After years of effort, Armstrong eventually succeeded in bringing a new library to the academy. Architect Louis Kahn was chosen to design the new library in 1965, and it was ready for occupancy in 1971.:390,394 Architectural historian Vincent Scully acknowledged its architectural significance by using a photo of it as the frontispiece for his book Modern Architecture and Other Essays. Henry Bedford, who became librarian shortly after the new library was occupied, supervised the transition not only to the new building but also to a new way of operating a library. Staff librarians were encouraged to see themselves as co-instructors with the regular faculty and to put less emphasis on shushing library patrons. A piano was installed and the library began sponsoring lectures and concerts. In 1977 Jacquelyn Thomas became the first librarian with full faculty status. By 2006 she oversaw a staff of seven, all with graduate degrees in library science. During Thomas' tenure the library's collection and programming grew to a size appropriate to a small liberal arts college. Today the library houses 160,000 volumes on nine levels and has a shelf capacity of 250,000 volumes, making it the largest secondary school library in the world. The library also contains a collection of works by alumni as well as the Academy Archives. The library was the first building on campus to be computerized thanks to the foresight of Armstrong and Kahn, who supplied the library with sufficient conduit space for the cabling needed by the coming computer revolution. In 1995, the library was officially named the Class of 1945 Library, honoring Dr. Lewis Perry, Exeter's eighth principal, who served from 1914 to 1946. Kahn had already thought deeply about the proper design for a library, having earlier submitted proposals for a new library at Washington University. :305 He also expressed a deep reverence for books, saying, "A book is tremendously important. Nobody ever paid the price of a book, they only paid for the printing". :290 Describing the book as an offering, Kahn said, "How precious a book is in light of the offering, in light of the one who has the privilege of the offering. The library tells you of this offering". The library has an almost cubical shape: each of its four sides is 111 feet (33 m) wide and 80 feet (24 m) tall. :309 It is constructed in three concentric areas (which Kahn called "doughnuts"). :87 In the words of Robert McCarter, author of Louis I. Kahn, "From the very beginning of the design process, Kahn conceived of the three types of spaces as if they were three buildings constructed of different materials and of different scales – buildings-within-buildings". :306 The outer area, which houses the reading carrels, is made of brick. The middle area, which contains the heavy book stacks, is made of reinforced concrete. The inner area is an atrium. The building committee's document specified that the new library should be "unpretentious, though in a handsome, inviting contemporary style". Kahn accordingly made the building's exterior relatively undramatic, suitable for a small New England town. Its facade is primarily brick with teak wood panels at most windows marking the location of a pair of wooden carrels. The bricks are load-bearing; that is, the weight of the outer portion of the building is carried by the bricks themselves, not by a hidden steel frame. Kahn calls this fact to the viewer's attention by making the brick piers noticeably thicker at the bottom where they have more weight to bear. The windows are correspondingly wider toward the top where the piers are thinner. :309 Kahn said, "The weight of the brick makes it dance like a fairy above and groan below." Another arcade circles the building on the ground floor. Kahn disliked the idea of a building that was dominated by its entrance, so he concealed the main entrance to the library behind this arcade. His original design, however, called for landscaping with a paved forecourt that would have indicated the entrance without disrupting the symmetry of the facade. :191 Architectural historian William Jordy said, "Perverse as the hidden entrance may seem, it emphatically reinforces Kahn's statement that his design begins on the periphery with the circle of individual carrels, each with its separate window." A circular double staircase built from concrete and faced with travertine greets the visitor upon entry into the library. At the top of the stairs the visitor enters a dramatic central hall with enormous circular openings that reveal several floors of book stacks. At the top of the atrium, two massive concrete cross beams diffuse the light entering from the clerestory windows. Because the stacks are visible from the floor of the central hall, the layout of the library is clear to the visitor at a glance, which was one of the goals the academy's building committee had set for Kahn. The circle and the square that are combined so dramatically in the atrium were considered to be the paradigmatic geometric units by the ancient Roman architect Vitruvius. :129 He also noted that the human body is proportioned so that it can fit in both shapes, a concept that was famously expressed with a combined circle and square by Leonardo da Vinci in his drawing Vitruvian Man. The outer part of the building, which houses the carrels, is built of load-bearing brick. Each carrel floor spans two levels of book stacks. The specifications of the academy's building committee called for a large number of carrels (the library has 210) and for the carrels to be placed near windows so they could receive natural light. :390 The latter point matched Kahn's personal inclinations exactly because he himself strongly preferred natural light: "He is also known to have worked by a window, refusing to switch on an electric light even on the darkest of days." Each pair of carrels has a large window above, and each individual carrel has a small window at desk height with a sliding panel for adjusting the light. 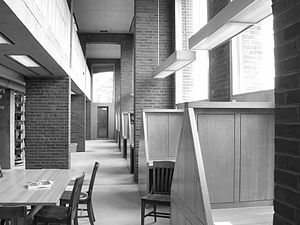 The placement of carrel spaces at the periphery was the product of thinking that began years earlier when Kahn submitted proposals for a new library at Washington University. There he dispensed with the traditional arrangement of completely separate library spaces for books and readers, usually with book stacks on the periphery of the library and reading rooms toward the center. Instead he felt that reading spaces should be near the books and also to natural light. :304 For Kahn, the essence of a library was the act of taking a book from a shelf and walking a few steps to a window for a closer look: "A man with a book goes to the light. A library begins that way. He will not go fifty feet away to an electric light. ":76 Each carrel area is associated with two levels of book stacks, with the upper level structured as a mezzanine that overlooks the carrels. The book stacks also look out into the atrium. Architectural experts sometimes differ in their interpretations of Kahn's design. For example, in reasoning why the cross beams at the clerestory windows above the atrium are so massive, Carter Wiseman says, "While they appear to be—and indeed are—structural, they are far deeper than necessary; their no-less-important role was to diffuse the sunlight coming in from the surrounding clerestory windows and reflect it down into the atrium. ":198 Sarah Goldhagen thinks there is more to the story, asserting that "the concrete X-shaped cross below the skylit ceiling at the Exeter Library is grossly exaggerated for dramatic effect." Kathleen James-Chakraborty goes even further: "Above, in the most sublime gesture of all, floats a concrete cross brace, illuminated by clerestory windows. Its weight, which appears ready to come crashing down upon the onlooker, revives the sense of threat dissipated elsewhere by the reassuring familiarity of the brick skin and wood details. ":87 Kahn similarly floated a massive concrete structure above the sanctuary of the First Unitarian Church of Rochester, which he designed a few years earlier. In 1997 the American Institute of Architects gave the library their Twenty-five Year Award for architecture of enduring significance, which is given to no more than one building per year. In 2005 the United States Postal Service issued a stamp that recognized the library as one of twelve Masterworks of Modern American Architecture. In 2007, the library was ranked #80 on the List of America's Favorite Architecture by the American Institute of Architects. ^ "Library Chronology". exeter.edu. Phillips Exeter Academy. 2017. Retrieved November 28, 2017. ^ "The Class of 1945 Library Contacts". exeter.edu. Phillips Exeter Academy. 2017. Retrieved November 28, 2017. ^ a b Fabrikant, Geraldine (Jan 26, 2008). "At Elite Prep Schools, College-Size Endowments". New York Times. ^ a b c d e f g Clark, Susannah (2006). "An Open Book" (PDF). The Exeter Bulletin. Phillips Exeter Academy (Winter). Archived from the original (PDF) on 2013-08-11. ^ a b c d Brownlee, David; David De Long (1991). Louis I. Kahn: In the Realm of Architecture. New York: Rizzoli International Publications. ISBN 0-8478-1330-4. ^ Scully, Vincent (2003). Modern Architecture and Other Essays. Princeton, NJ: Princeton University Press. ISBN 0-691-07441-0. ^ a b c d e f g h i j Wiseman, Carter (2007). Louis I. Kahn. New York: Norton. ISBN 0-393-73165-0. ^ a b c "About the Library". Phillips Exeter Academy. Archived from the original on March 15, 2011. Retrieved June 3, 2010. ^ a b c James-Chakraborty, Kathleen (2004). "Our Architect" (PDF). The Exeter Bulletin. Phillips Exeter Academy (Spring). Archived from the original (PDF) on 2010-05-27. ^ a b c d e f g h i j McCarter, Robert (2005). Louis I. Kahn. London: Phaidon Press. ISBN 0-7148-4045-9. ^ a b c Kahn, Louis; Alessandra Latour (1991). Louis I. Kahn: Writings, lectures, interviews. New York: Rizzoli International Publications. ISBN 978-0-8478-1356-8. ^ a b "Design of the Library". Phillips Exeter Academy. Archived from the original on July 30, 2011. Retrieved Feb 8, 2011. ^ Huxtable, Ada Louise (2008). On Architecture: Collected Reflections on a Century of Change. New York: Walker Publishing Company. p. 190. ISBN 978-0-8027-1707-8. ^ a b Placzek, Adolf, ed. (1982). "Louis Kahn". Macmillan Encyclopedia of Architects. New York: Collier MacMillan. ISBN 0-02-925010-2. ^ a b c Scully, Vincent (1993). "Louis I. Kahn and the Ruins of Rome" (PDF) (Winter). California Institute of Technology. ^ Jordy, William (2005). Symbolic Essence and Other Writings on Modern Architecture and American Culture. New Haven: Yale University Press. p. 254. ISBN 0-300-09448-5. ^ Fleming, Steven (2006). "Theorising Daylight: Kahn's Unitarian Church and Plato's Super-Form, The Good". arq: Architectural Research Quarterly. Cambridge University Press. 10 (1): 25. doi:10.1017/S1359135506000091. ^ Goldhagen, Sarah (2001). Louis Kahn's Situated Modernism. New Haven, Conn: Yale University Press. p. 3. ISBN 978-0-300-07786-5. ^ "Architectural Excellence Receives Stamps of Approval from the Postal Service". US Postal Service. Archived from the original on May 3, 2010. Retrieved June 3, 2010. Wikimedia Commons has media related to Exeter library. The Phillips Exeter Academy library's web site is an excellent resource. Click on "Design of the Library" to see links to a Kahn Reference Guide, Floor Schematics, etc. Figure 6 of an academic paper called "The Tectonic Integration of Louis I. Kahn′s Exeter Library" provides a helpful exploded view drawing of the library's constituent parts. This page was last edited on 22 March 2019, at 18:52 (UTC).